Glad to hear more positive feedback about the exhaust. Have had mine on for a couple months now and I would have to say it was worth the money. Looks good and sounds real good, exactly what I was looking for. Is the install hard to do? what kind of tools are needed, can a fairly novice person do it? and How long do you expect it to take? 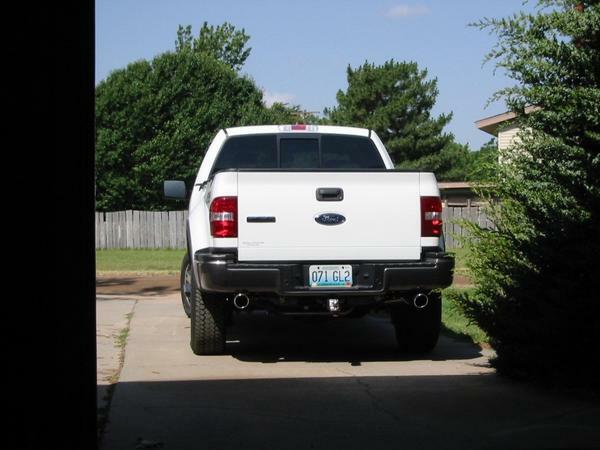 I cant answer your questions first hand as I dont have my borla exhaust yet, but you can search the 04 forum for borla and find your answers. I think someone even lists the tools needed. Mine was a tad harder to install than I expected. Since I am a larger guy, I wasn't looking forward to crawling under my truck to put this thing on. Luckily, the muffler shop I ordered it through said he would help me install it for free. Since he had a hoist I thought it would be easier than doing it on the floor. The hardest part was he couldn't work some of the parts together so I had to struggle to join them at times, and I am by no means a weakling Oh, and if you do have access to a hoist, I would remove all the hardware for the stock exhaust and put it on the ground. It would have been way easier to use your legs to push the old thing off then yanking it with your arms! I have decided on the Borla but I am having trouble deciding to go out the back or the side. Have heard that there is low or high end torque loss out the back. Don't know if that was with the Borla or something else or a different pipe diameter. Any opinions? I probably like the look out the side better but could live with out the back. Re: Scab owners with borla? I was wondering how many scab owners with the 6.5' bed had a borla system installed and what they thought about it. Count another one... mine just shipped(single in/dual out) and I expect to get it sometime next week. I bought on 9/9 from Socal Motorsports on eBay. John at Socal worked things out despite some misdirected communications which delayed things. Paid $589. It's sound should balance the Airaid nicely. Quick Reply: Scab owners with borla?